Every year approximately 2 million wildebeest – and several hundred thousand zebra, eland (the world’s largest antelope) and gazelle – migrate to follow the rains and the resultant sweet, fresh grass. Between late June and October they are crossing the large rivers ( Grumeti and Mara Rivers) in the Northern Serengeti and the Maasai Mara Reserve in Tanzania and Kenya respectively. The river crossings are one of the natural world’s iconic spectacles. It can be very dramatic due to the large numbers of animals attempting the crossings to get to better pastures. The event is not for the faint hearted! Many animals drown or are injured, caught and eaten by Nile Crocodiles or are ambushed by predators on land ( lion and leopard) as they enter or leave the rivers. Viewing the migration at any time of the year is a natural phenomenon that can’t fail to impress but the river crossings demonstrate the harsh reality and effort required for Africa’s wildlife to survive. Both the option to see the crossings whilst on safari and the video should be viewed with discretion as some may find the action or video footage disturbing. I have to say that this safari was a defining moment in the year because of the iconic sightings we were able to view and capture on film. You can watch the migration safari video here. In June I had the pleasure of privately guiding a family from San Francisco on a safari to Botswana’s Okavango Delta. This was a safari of the highest order combining two of Botswana’s best private safari concessions; Mombo and Vumbura. As is usual, in these areas the game-viewing was “off the charts”. A highlight was on dusk one afternoon, when we came across one of the biggest maned lions I have ever seen. He sat by our vehicle and roared, announcing himself to the neighbourhood. Once you have had a lion sitting next to you roaring full throttle you will never forget it! In the second half of August I had the pleasure of guiding a small group of intrepid travellers on an incredible safari. This trip combined the remote south-west of Tanzania with Rwanda. The main focus was primates – chimps in Mahale Mountains on the shores of Lake Tanganyika and gorillas in the Virunga Mountains of Rwanda. We also spent some time in the very remote Katavi National Park where we took in some more general game and safari pursuits (walking and game-driving). We were blessed with some amazing experiences; lots of elephants, lion, hippo, giraffe and of course chimps and gorillas. Chimps are our closest relative and to learn about them and observe their behaviour is spell-binding. 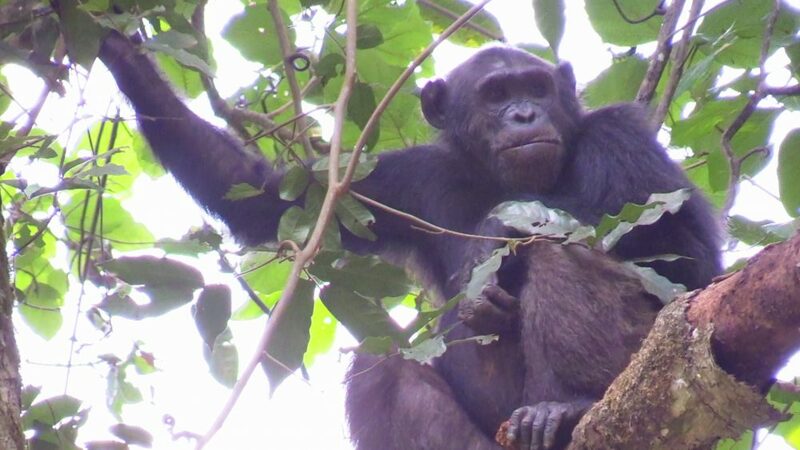 After a chimp experience in Mahale you can almost understand the wranglings of human politics. Talk about manoeuvring and alliances (and broken alliances)! Gorillas on the other hand are much more gentle and in my experience, offer possibly the greatest wildlife experience on the planet. If you have a love of nature, an up close and personal experience with gorillas is as good as it gets. I hope you enjoy these video highlights. Please let us know if you are interested in joining us on any African journey of a lifetime.